When I meet Kenny Wilson, the affable yet determined powerhouse heading up Cath Kidston as its CEO, he certainly seems to be enjoying his job. The news that the company has been bought out by private equity group Barings Asia has just gone public. Wilson describes the transaction as representing a continuity of ownership and indeed, a simplification of the stakeholder structure, leaving just one investor and giving access to more funding to drive their next phase of growth. A smooth deal then, but even if the takeover waters had been choppy, Wilson strikes me as a man who can cope with pretty much any difficulty thrown at him, not least because he is open-minded enough to be on an ongoing journey of learning and self-development and has both the courage and humility to surround himself with capable people. But more of that later. Wilson and his team have been busy. The month before we chat in his cosy office in west London – complete with pastel plaid armchair, splashes of characteristic Cath Kidston designs and a few choice pieces of memorabilia from Wilson’s illustrious career – they have launched two brand new product ranges with huge success. The first stage of the pioneering design-led collaboration with Disney, based on Winnie the Pooh, sold out in just three days, after 127,000 people signed up for a special promotional code the night before the launch. It was the outcome of a lot of innovation and hard work, yet the runaway success of the new range nevertheless took them by surprise: ‘we knew it would be good, we just didn’t think it would be this good!’ exclaims Wilson, clearly – and deservedly – delighted. A second brand new range, called Future Florals, a bold, modern take on the classic feminine Cath Kidston designs, is also outperforming expectations. Wilson is 50, but looks much younger, casually dressed in jeans (Levi’s!) and a checked shirt. Growing up in Aberdeen, in a Scottish family that emphasised the value of hard work, he originally wanted to be a footballer. And he was talented: as a teenager he trained under the world-famous manager, Alex Ferguson, and was offered a club signing. It wasn’t with a top division team though, and always fiercely competitive, he didn’t want to be ‘a second rate player’ (his words) and so instead he went to university to study English and psychology, for a while setting his career sights on becoming a journalist. Deciding that wasn’t for him, still hungrily ambitious, he was drawn to the target-driven aspects of business and began an astonishingly upwardly mobile career at Levi’s, where he stayed for 19 years. At the age of 34 he was running a $1.6 billion business as President Levi’s Brand EMEA. It was at this point that he was given a coach – he says Levi’s are fantastic investors in their people – and began his journey of leadership development in earnest. At that point he didn’t know what he didn’t know, he just knew he had a lot to learn and was keen to acquire that knowledge. Coaching has helped him immensely, he shares, in a number of changing ways. Initially it helped him step up to a massive job in which he had limited experience. Later it helped him finesse his leadership style, building the agility to lead appropriately with different people and in different situations. Several times in the course of our conversation I’m reminded that Wilson is a psychology graduate and has always been interested in what makes people tick. He has a huge degree of self-awareness and talks intelligently and animatedly about the value of a positive focus, of working to strengths (and being aware of the dangers of overplaying them), of recognising the differences in people, of the power of digging out and overturning self-limiting beliefs. One of the things that helped him at first but later held him back, he offers, was the ingrained belief that success could only come through long hours, hard work and ‘off-the-scale drive’. In very senior roles, that can lead to over-tiredness and can be damaging in other areas of life, so eventually he learned to let it go, building instead a leadership style founded on having a clear vision, definite priorities, a good work-life balance, and hiring and developing the right people. He learned the significance of focusing on the people agenda during his time at Levi’s, and with his endearing ability to coin the right phrase at the right time, he says he believes that ‘a 7/10 strategy with 9/10 people gets results’. Other Wilsonian mantras include ‘what you appreciate appreciates in value’, ‘what you can conceive you can achieve’ and ‘to be a leader you have to have followers’. From some, such statements could sound trite or insincere, but in Wilson’s voice, they have a passionate authenticity that I found compelling. Plus I am a bit of a fan of the one-liner myself. As a leader, Wilson evidently evokes loyalty in his followers, and his senior team at Cath Kidston includes several people he brought in from Levi’s. He still informally mentors former colleagues from both Levi’s and Claire’s. I am curious about what tempted him from the world of the big corporate – having finally left Levi’s, he spent three years as President (Europe) of Claire’s Accessories, where he led the company through a successful turnaround in tumultuous retail times. 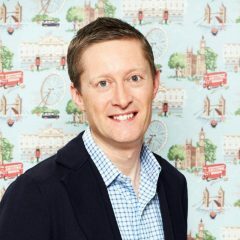 He liked the brand and respected what founder Cath Kidston had achieving in building the business from the ground up, something he’s never done, and he responded well to the trust she placed in him as her new CEO. Again the people factor played a big part, as it was Paul Mason, Wilson’s former boss as President of Levi Strauss (EMEA) and later the Chairman of Cath Kidston, who initially headhunted him for the role. He says he had the luxury of walking in and taking on the stewardship of a successful, growing company with lots of potential to expand geographically, broaden the product range and reach out to new market segments. After five years at Cath Kidston, Wilson says he has never regretted the move. He still enjoys coming in every day and savours the sense that they’re building something. His energy and delight in the job are palpable and as he spots my Cath Kidston pencil case as I pack my bag to leave (I’ve had it probably as long as Wilson has been at Cath Kidston and it goes everywhere with me), he returns to his key point about leadership being as much about the enjoyment as the performance, although both are critical: without the achievement there is less enjoyment. The essence of the Cath Kidston brand is ‘the home of modern vintage’. Wilson’s mission is to make it a global home. They’re not they’re yet, but they’ll get there, he pronounces. I believe him. Under his breeziness and his thoughtfulness, there runs a steely drive which gives the impression he will execute on his vision and not only that, he will enjoy the challenge.